Demotix/R. Byhre. Norwegian flag in Breiavannet. The inscription reads "Our thoughts go out to the stricken at Utøya and the Oslo bombings". All rights reserved. The medical doctor who had first examined Behring Breivik after his transfer to a high-security section of Ila Prison in Oslo in late July 2011 found no evidence whatsoever of psychosis; nor did a team of external psychiatric experts tasked with following the mass murderer in the following months. But by far the most damaging report came from Randi Rosenqvist, the most senior of Norwegian court psychiatrists, responsible for Norway's standard text book in the field. As the psychiatrist in residence at Ila Prison, she had several consultations with the mass murderer in the course of the autumn of 2011, but was unable to find any evidence of psychosis or schizophrenia. For those who had familiarised themselves with the mass murderer’s life world through reading his tract and various web postings, the trial itself would not offer much in the way of startling revelations. We learned that Behring Breivik considers Muslims to be ‘animals’ and that he found the actions of Serb genocidaires in Bosnia in the 1990s ‘inspiring’. Where the mass murderer had feigned disapproval of Norwegian and European neo-Nazis in his tract, the trial provided a clearer endorsement of a long line of European neo-Nazis; from the accused Swedish serial killer of immigrants in Malmoe, Peter Mangs, to the German cell of neo-Nazis who killed eight Turks, a Greek and a police officer in Germany from 2000 to 2008. Most central among these witnesses would have been perhaps Peder Are Nøstvold Jensen. Known as ‘Fjordman’, he was Behring Breivik’s main ideological inspiration, whose essays are cited in extenso no less than thirty-nine times in the mass murderer’s tract. And there was Bruce Bawer, a popular author in the ‘Eurabia’-genre, cited twenty-two times in the tract who in a pamphlet titled The New Quislings published at a small US imprint in early 2012 would directly incite people to violence against any number of Norwegian academics and politicians on account of their supposed ‘treason’ by referring to these as ‘quislings’. Also called by the defence was Hans Rustad of the mass-murderer’s favourite Norwegian right-wing website, and Walid al-Kubaisi, author and documentary film-maker in the ‘Eurabia’-genre cited three times in the tract. In Bawer’s case, it surely takes a contorted logic to identify Norwegian social democrats - exactly those who along with Norwegian Communists opposed Vidkun Quisling’s regime under the German Nazi Occupation of Norway from 1940 to 1945, and often paid with their lives for doing so - with the name of Quisling. Bawer’s venting of fury over the fact that a mass murderer cites him and his book as a significant source of inspiration is perhaps understandable. Less understandable is the fact that in his pamphlet, he lifts two completely fabricated claims straight off the pages of the same mass murderer’s tract, namely the claim that ‘hundreds of Norwegian teenagers’ had been killed by Muslims over the years and the equally bizarre and undocumented claim that the radical left and anarchist organisation Blitz are the ‘storm troops’ of the Norwegian Labour Party. Bawer, who before 22/7, and by virtue of his close association with the think-thank Human Right’s Service (HRS), was on the reading lists of some of the most prominent MPs from the PP, has now officially fallen from the PP’s graces. Furthermore, what Prof Teuns van Dijk in 1992 referred to as ‘denials of racism’ in its various forms remain widespread in Norwegian society – not the least among liberal and intellectual elites who live lives for the most part shielded from what many minority individuals experience in Norway. Those following newspaper discussion threads in mainstream Norwegian newspapers in the course of the 22/7 trial will at times have had reason to think that extreme right-wing Islamophobes are omnipresent in Norway, even if this is seldom more than the optical illusion that such people try to create by treating the web as a ‘battlefield’ ( and yes, you will no doubt find some exemplars of the species in the commentary field after this essay ). In the Norwegian context, the discrepancy is not, as it happens, one between restorative and retributive justice. In the context of the 22/7 trial, neither option is seriously entertained by anyone - at least publicly. The discrepancy with which Norwegians will have to live in the years to come, is simply one between those who regard Anders Behring Breivik as a criminal fit to be held responsible for his actions on 22/7 2011, and those who regard him as a mentally ill person. Though not identical with this, the discrepancy also maps on to a moral-philosophical conception in which human evil exists, and one in which acts of evil are simply articulations of mental illness. In the latter case, especially so, if these acts are perpetrated by white Norwegians. Rendering 22/7 as mere articulations of mental illness will provide those who happen to share parts of Behring Breivik’s world-view with an all too-facile means of distancing. It has become part of the rhetorical repertoire of extreme as well as populist right-wingers in Norway to declare the Norwegian mass murderer to be ‘mad.’ In the court testimony of Husby and Sørheim, perhaps the most troubling part related to Husby’s reference to ‘Fjordman’ having declared Behring Breivik to be ‘mad’, as if web postings from an extreme right-wing and Islamophobic ideologue were in themselves supporting evidence for their own diagnostic conclusions. Meanwhile, work by distinguished academic scholars on political paranoia, such as Profs Robert S. Robins and Jerrold M. Post’s Political Paranoia: The Psychopolitics of Hatred from 1997 suggests that paranoia is the most politically inflected of psychopathologies. Faced with another self-righteous extreme tirade from the man who had murdered their children and their friends on the last day in court, survivors and the bereaved walked out of court in a demonstration of their contempt for Behring Breivik. Many of them will - like me - surely hope that Norway and Norwegians will never again have to listen to him and his monstrous ideas. There is and can be no other way forward for Norway and Norwegians than the rule of law, so forcefully defended by the survivors and the bereaved in the course of the trial. But for some of the survivors and the bereaved, who have been to hell and back, and continue to live in the shadow of excruciating daily physical and mental pain as a result of what a man did on 22/7 2011 who still considers himself a ‘saviour’ and a ‘hero’, that may in the end prove to be a very high price to pay for the rule of law. But regardless of the outcome of the trial – this much is clear: the now thirty-three year old Anders Behring Breivik has already lost the battle to shape the future of multicultural Norway. 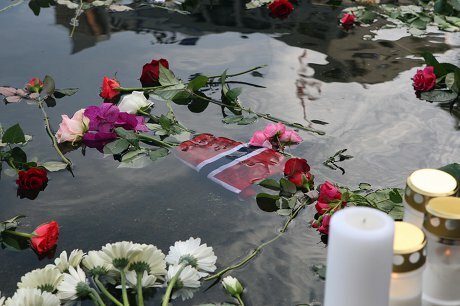 And we will say this again and again: history does not – and never will - absolve anyone for human evil of the kind perpetrated against innocent children, women and men in Norway on 22/7 2011.